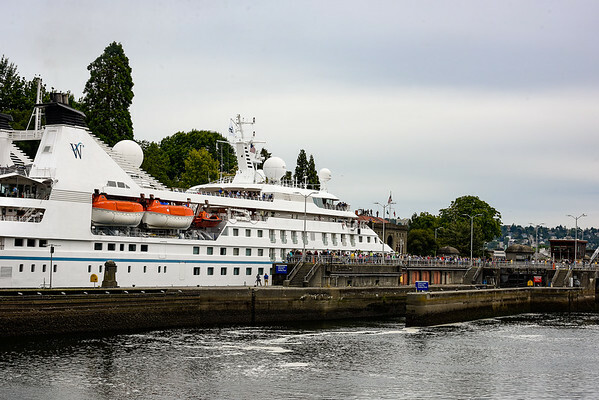 On June 27, 2018, Star Legend became the largest cruise ship ever to transit the Ballard Locks and sail onto Lake Union in Seattle, Washington. Star Legend’s inaugural visit to Seattle was especially significant, as the 212-passenger ship is owned by Seattle-based Windstar Cruises, a small ship cruise line with a fleet of six ships sailing worldwide but that had not had a ship in Seattle in nearly three decades. Images of the event may be viewed and downloaded here. 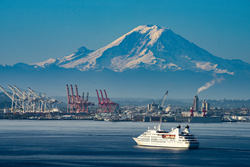 Star Legend called on Seattle as a special detour from its summer series of inaugural Alaska cruises, running from May through September. The ship carried Windstar employees, VIPs, travel partners and media on board for the day, which was a grand homecoming for the company with hundreds of people lining the locks and shoreline for the event and local media covering the spectacle live on board and from helicopters above. The ship had roughly 12 feet to spare as the 63-foot wide and 440-foot-long vessel made its way through the locks. Beginning at Pier 66 in Seattle, Legend first took a scenic cruise of Elliott Bay before transiting through the Ballard Locks, as well as through the Lake Washington Ship Canal and under the Ballard and Fremont Bridges. On board, catering was provided by Seattle’s own Renee Erickson, a James Beard award-winning chef who has sailed with Windstar as part of its unique partnership as the official cruise line of the James Beard Foundation. While on Lake Union, Zodiac rides were given to guests, highlighting the new fleet of six inflatable rugged boats that are a key part of Windstar’s new Signature Expeditions program in Alaska. During an official ceremony on board, the Zodiacs were named after prominent Seattle figures including Chef Renee Erickson and Bonnie Elgin, brand advisor and the wife of Seattle advertising guru who penned Windstar’s tagline, 180 degrees from ordinary. Visit http://www.windstarcruises.com for more information on the cruise line and ship.